Kid-friendly London hotels that can accommodate a family of 5 or 6 in one room are listed in alphabetical order below. The interactive Google map shows each family friendly hotels’ London location. Most of the hotels are in central London. There are also two near the London Gatwick Airport, and two near Heathrow Airport. The price or rate range of each hotel, for budgets from cheap to luxury, is indicated. See the $-symbol key in the sidebar. A $ or $$ will be a cheap family accommodation. London also has luxury family hotels, indicated by $$$$ or $$$$$. Click on a hotel name for more details. The list below includes large hotel rooms, family suites, and an apartment hotel. We hope to help you find just where to stay in London with family! 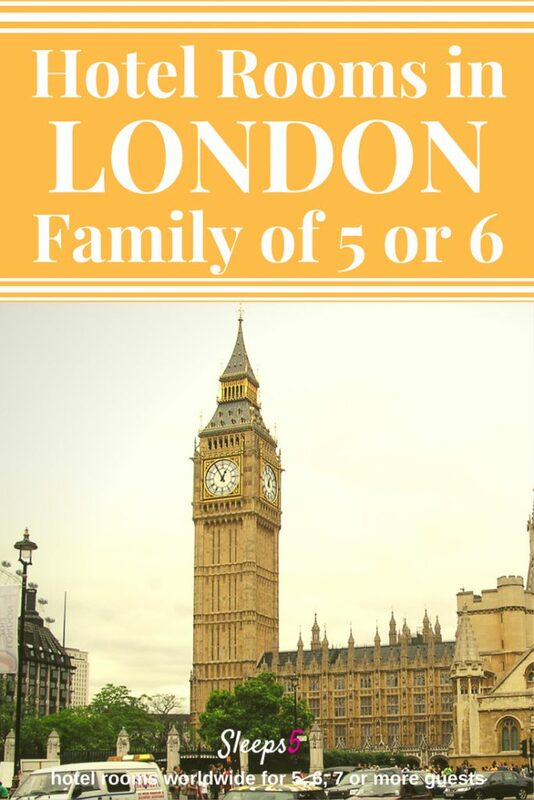 Please comment below or email to let us know about other London family hotels for 5, 6, or more. We’d love to list them here. Located in the heart of Central London, the Regency House Hotel is a beautiful, traditional Georgian Grade 2 listed Terraced Hotel. Its’ History can be traced all the way back to the first family owners, the 4th Duke of Bedford in the 1790’s and a more detailed account can be found here. We offer some of the best value Single, Double, Twin, Triple, Quad, and Quint Hotels Rooms in central London. All of our Rooms are comfortable, elegant and decorated in traditional Georgian style, perfect for either short or long stay visitors. Ideally situated in the famous literary area, Bloomsbury, it is extremely close to many of London’s attractions and points of interest. A short walk or tube ride away are: Oxford Street, Soho and Covent Garden, the British Museum and London’s Theatre Land. In the opposite direction you can find Regents Park and Camden, Madame Tussauds and the London Zoo. See our attractions page for further details of what’s close by. Transport connections are excellent, with Tottenham Court Road, Goodge Street, Warren Street and Euston Square Underground stations all within five minutes walking distance. Thank you so much for notifying Sleeps5 about Regency House Hotel! We will add an entry about it to the London page right away. Stayed at the Park Plaza Victoria (Vauxhall Bridge Road). 2 Adults & 3 kids. Hotel staff were immensely helpful in getting us connecting rooms which sets them apart from all the other hotels we approached. Kids room had a king size bed and sofa bed in it. Ours just had a double. Thank you so much for notifying Sleeps5 about Park Plaza Victoria hotel! We will look into adding an entry about it to the London page. Usually, we limit listings to hotels that offer one room for a family of 5, but Park Plaza may qualify if there is a single hall entry for the two rooms, and/or if the connecting room configuration is priced together and discounted. That is great news! We really appreciate your letting us know about the London hotel you found that will accommodate your family of 5. We will get it added to the London listings. May I ask what are the ages of your kids? I can contact the hotel to find out if 5 to a room would be allowed even if the kids were all teens, for example. Sometimes a hotel allows 5 to a room only if at least one child is very young. Thank you for commenting and helping other traveling families! DoubleTree by Hilton London Docklands Riverside, Short Lets in London – Highbury, EasyHotel London Heathrow. every premier inn we have been to allows 2 adults and our 3 children aged 2, 3 and 5. Thank you so much for providing the additional London hotel accommodations you’ve found! We’ll look into those and add them to the listings above if they meet our website’s criteria. Sleeps5 lists accommodations that have 24/7 staff, private bathrooms (ensuite), and that can sleep all members of a family of 5 or more in one room. We’ll also research if there are any limitations, such as children’s ages, or beds sizes available. Your information is very helpful for other traveling families! Did you have to call the Premier Inn to get a room for you all? The website only allows you to select 2 kids, if you’ve selected 1 room. Hi Neil, How old are your children. I always put 2 adults, 2 children and add a cot. that way, they are aware that there is 5 to a room. my children are young enough that they can double up in the beds . we tend to use those pillow type things hey leave on the bed, as a sort of bed guard. Lord Kensington Hotel (Earls Court, London) has a room suitable for up to 5 adults. Thank you for notifying us at Sleeps5 about the Lord Kensington Hotel. Its listing has now been added to the London page, and to the map, above. We are happy to correct or add any further details or insert a photo. We’ve just returned from a stay for family of 5. (2 adults and 3 kids). I would thoroughly recommend this hotel for families. The family rooms have 2 double beds and a sofa bed, 2 large screen Tv’s, Wi-Fi and the hotel has great facilities including a pool. The staff could not be more helpful and it is located just across the road from the Edgeware rd circle line station so is great for getting around London. Thank you so much for letting us know about Hilton Metropole in central London! The Family Superior Room sounds perfect for a family of 5. Amazing to have a hotel pool in London, too! I’ll get it added to our London page of family friendly hotels right away. We really appreciate your taking the time to send us the information and to describe your experience there. It will be of great help to other family travelers, too.